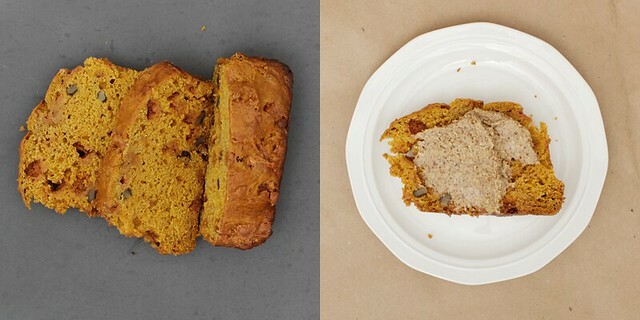 I’m kind of in love with this pumpkin bread. That up there is the second loaf I made. And the second loaf I nearly devoured all on my own. I’m sort of convinced that I’d be really good at one of those eating contests, but I don’t want to try it because I would probably win them all and end up on MTV True Life. And that stuff never turns out good. Entertaining, but not good. i.e. the turrets episode. It’s moist and delicious, and only has 4 T of butter in it. It’s lightly spiced with sweet morsels of butterscotch. Whoa Momma. It’s not that bland/spicy stuff you buy at Starbucks. Eat it on it’s own, or with butter, or even better – almond butter. This recipe is an adaptation of several banana bread recipes + a cookie recipe. It’s my little Frankenstein baby. Speaking of Frankenstein, Halloween is almost here. Which means a lot of kids knocking on my door wanting candy. It’ll technically be my 5th Halloween where I have my own place. All the places I’ve lived up here have had varying amount of kids. The first place I lived, I got one pair that knocked on the door. Then I thought I had another trick-or-treater but it was the same kids trying to pull one over on me, then they told me their mom thought I was hot, which caused a loud “dammit” to come from the darkness. The past couple have had a good amount of kids. And most of them can’t wait to get their grubby little hands on candy I bought. First off, don’t go out and buy all the good candy to hand out. You save your money and buy it half off Nov 1 then eat it all yourself. What you want to do is buy one bag of good candy to make you seem cool, then buy a lot of cheap candy from the bulk bins, like those off brand smarties. Awful off brand peanut butter cups? Now you’re talkin’. Save the Snicker’s and Butterfingers for yourself. Really really fat kids – you’re doing them a favor – I used to be in those pants. Those really bratty kids that don’t say thank you. Don’t be afraid to reach in their bag and take back a piece if you accidentally gave them two pieces. Or tell them Santa doesn’t exist. Also, whenever in doubt, grab a handful of candy and just pretend to put a piece in their knapsack. By default, those kids who get scared because your friendly dog dressed as a sheriff busts through the door and kind of scares them. But this definitely doesn’t include that tootsie roll clan. Any polite kids that say thank you. Awesome homemade costumes. Always win. Over the top cute kids. Funny costumes. If you can make me laugh I will literally throw candy at you. My way seems a little better. Plus you can be all angry and dress up in a suit and pretend you’re Andy Rooney. Maybe with a tiny hat? It’ll make sense with your dog dressed as a sheriff. Preheat oven to 350F and grease a 9×5″ Loaf Pan. I’d assume a muffin tin with a smaller cooking time would work, so maybe you can try that. Sift all the dry ingredients together in one bowl. In another mix together all the wet. Add the wet to the dry, along with the butterscotch chips and walnuts. Fold everything together, just until combined, do not overmix. Pour into that pan and bake for 45 – 55 min or until a skewer/toothpick/fork/knife inserted into the middle comes out clean. Let cool in pan for 5 min, then relocate to a cooling rack to cool completely. Then devour.